Are you thinking of redesigning your garden? If so, please check out our garden design page or see our case study to see how we transformed a garden into a subtropical entertainers paradise. From the initial garden design, through the construction and planting, we can handle it all for you. Or we can do the bits you don't have the resources to do. Indoor outdoor flow is a key ingredient in any design to get people to use their garden more and making it look enticing from the house is really important. None of us want to be a slave to the garden so we design gardens to reflect your lifestyle and your desires. If you would like a special sculpture or water feature designed as a focal point for your garden (or even for your office), check out our sculpture and water feature pages. We can manufacture and deliver these to anywhere in the country. Because we work closely with you throughout the design and implementation we know you will be pleased with the results. Neil has done a terrific job and our new garden looks amazing. We are very impressed with Neil’s ability to quickly size up our problem and come up with such a great solution. 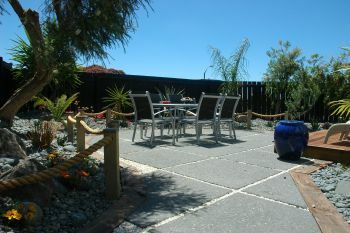 We cannot recommend Neil highly enough and anybody considering landscaping should look no further than Rata Landscapes who can turn the ordinary into the extraordinary.